Gorgeous Gift Ideas For Christmas! With a couple of months to go before Christmas, we thought now would be a good time to inspire you with some gorgeous gift ideas! As always, we have some wonderful accessories that would make great presents for your loved ones. From Ted Baker, there are some beautifully packaged sock packs and wallets. We have some colourful polka dot scarves, bags and purses from Earth Squared. 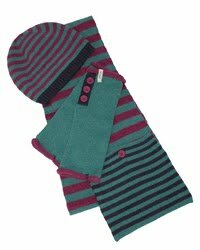 And from Seasalt Cornwall, there are matching hats, gloves and scarves, as well as super soft patterned socks. All of these gifts are available in both our Honiton and Exmouth shops, or online. Enjoy your Christmas shopping! We are pleased to announce that our standard delivery charge for web items has now been lowered from £4.50 to £3.50! Be one of the first to take advantage of this by visiting our website. We have some fabulous new items from Sandwich and some beautiful leather boots from Cara London. Have fun shopping!